Care Packages for Soldiers: Veterans Day Collection Drive at Market Street, Plano, TX. Veterans Day Collection Drive at Market Street, Plano, TX. 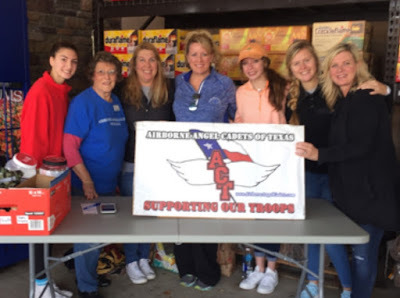 The Preston Bluebonnet chapter of the National Charity League (NCL) and the Airborne Angel Cadets of Texas held a collection drive on Veterans Day, Saturday, November 11, 2017 at Market Street (Plano, TX) to support our military troops. A special thanks goes to NCL for organizing the drive, Market Street Plano and all the volunteers who helped out; we are very thankful for your support. Plus, we can't forget get to thank the wonderful patrons of Market Street that were so generous with their donations ... over 20 large boxes, and many generous financial donations, were collected. The Preston Bluebonnet chapter of NCL helped with a collection drive for the troops. to be included in care packages for our troops overseas. Some of the great volunteers that worked the collection drive on Veterans Day. Thank you NCL for your continued support.